From Bedlam Walls Point, tracks meandered northward and before long a large quarry was visible on the other side of Shag Bay. At its base I could see the rusting remnants of machinery parts. Descending to Shag Bay at this point seemed perilous so I turned right and found tracks moving inland parallel to the Bay. Fresh wallaby poo beside the track: black olive sized and shaped, glistening in the sun. 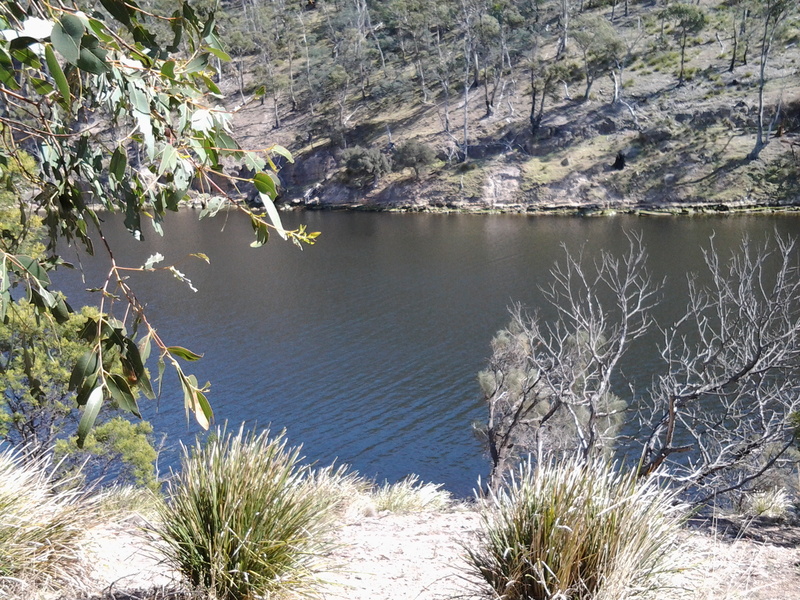 I did not see the wallaby which undoubtedly would be looking elsewhere for a midday shady rest spot. Large grey-brown fantailed birds darted amongst the trees. I was back on the main track at 10.45am and a couple of minutes later reached a sign marking the start of the East Risdon State Reserve (dogs prohibited, even on leads). The deep dark brown green water of Shag Bay rested liked a solid plane behind the sign. Very seductive. Once at the water’s edge I was surprised how clear the water was except for the natural colouring and tannins from native plants. I stepped carefully down the rocky crumbling path to the Bay. The quality of light was extraordinary. Rain during the night had cleared the air and the colours of the landscape were clear. I reached the bottom next to the water’s edge of Shag Bay after a further five minutes, and breathed in my surrounds, feeling very joyful to have such easy access to this beautiful environment. Temporarily I was startled by the spectacle of a massive White Bellied Sea Eagle flying up and down Shag Bay. I stood spellbound unable to move to click a photograph. Have a look at the photo on http://www.parks.tas.gov.au/?base=5115 and see the large fish in the eagle’s talons. It wasn’t long before a large (but much smaller than the eagle) black bird came and swooped at the eagle to drive it away. It’s not an easy life for these birds; they have no rest. 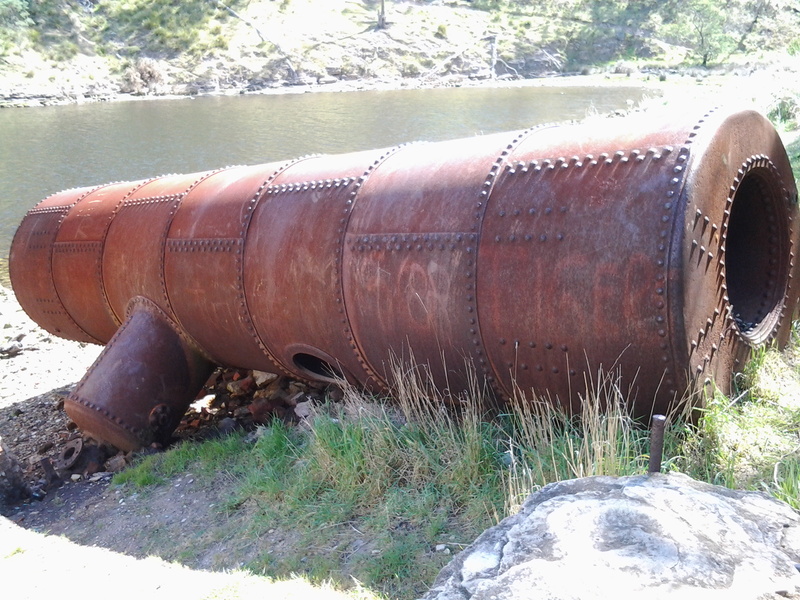 As I continued along the foot of the Bay, I came across an old rusting boiler up on the rocks, a massive lump of concrete, and other rusting metal in the water and around about. A couple of minutes before 11am I reached the boiler used as part of a blood and bone factory in the late 19th and early 20th centuries, shown in the photos above, then a few minutes later I reached the curve of the Bay and could see a second old boiler partly obscured by the bush. Apparently the Tasmanian Fertiliser Company was operating here for many years until a massive boiler explosion caused death and destruction resulting in the business folding. You can read the records of the inquest at http://trove.nla.gov.au/ndp/del/article/10403147. 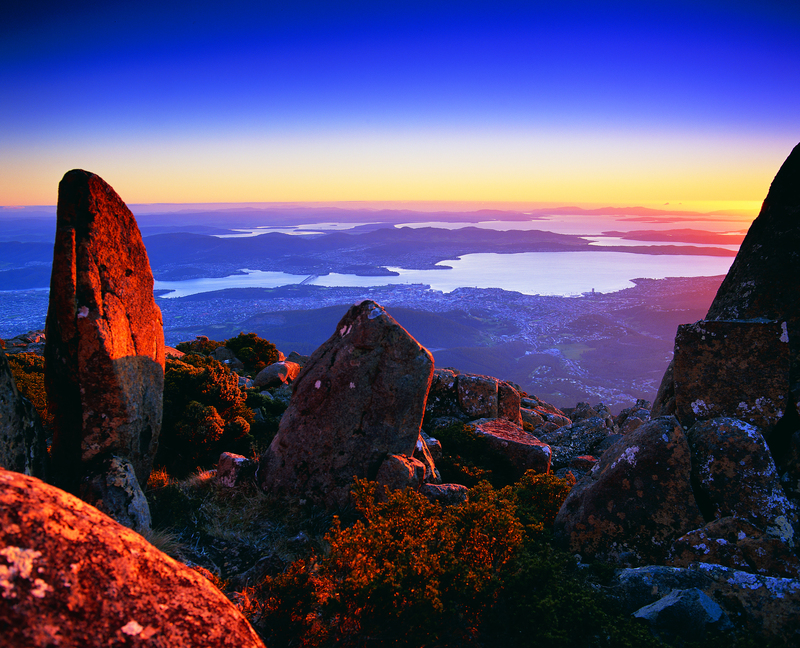 Looking down the Bay, past two fishermen in their outboard motored runabout, I soaked in the view of the western shore of the Derwent River with Mount Wellington rising above it. Hardly any air movement and the temperature was cool enough to make standing in the sun a comfortable delight. Prior to the walk I did uncover information (http://www.parks.tas.gov.au/indeX.aspX?base=1799) that Shag Bay was used for the demolition of boats such as the HMS Nelson in 1926. 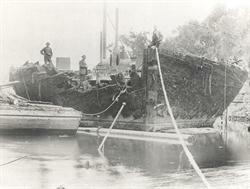 The photo below is from the collection of the State Library of Tasmania. I saw no evidence of boat demolition during my walk around Shag Bay, however on a second visit if I investigate the quarry maybe I will find materials of interest. Geilston Bay to Shag Bay will take 45 minutes (although another website suggests an hour and a half for the return trip). I took considerably longer by following unofficial tracks and taking time to observe the land around me as I walked. Apart from the two fishermen on the Bay there was not a soul around. I cannot recommend this walk too strongly. 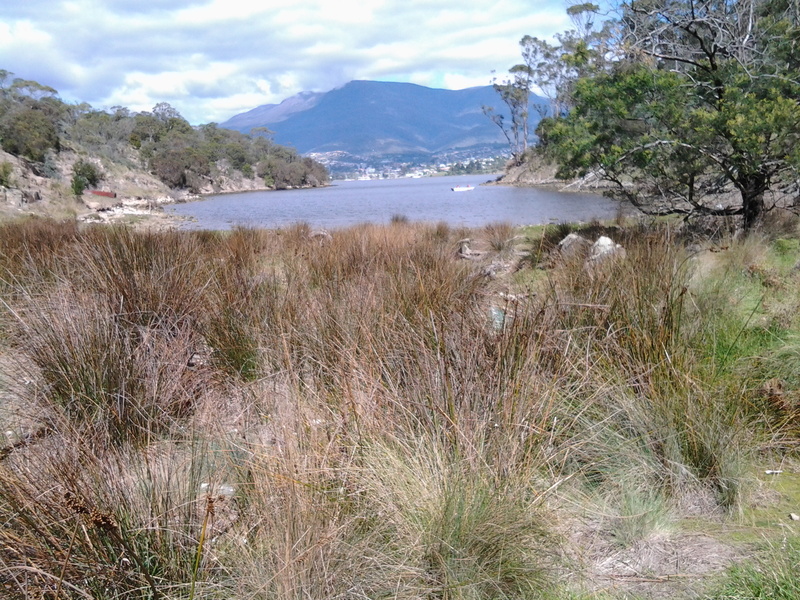 Everything about the walk and the location is attractive so I hope people living in Hobart will take themselves out to Geilston Bay and make their own discoveries. The website at http://highteawithhominids.squarespace.com/ancient-humans/2011/8/19/bedlam-walls-a-walk-in-tasmania.html provides additional details which may help locate some of the historical sites that I missed. Also on the Clarence City Council website, the claims are made that the track is well signposted. This is not true. 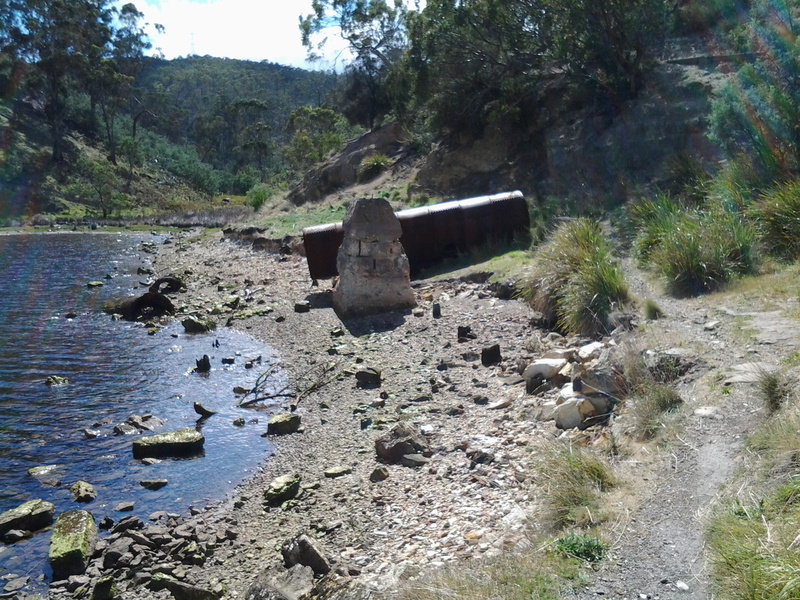 I saw three signs only: Geilston Creek track from the bus stop, Bedlam Walls sign including a map to Shag Bay at the start of the track, and the East Risdon State Reserve billboard close to Shag Bay. Considering the myriad of unofficial tracks that will attract the attention of many walkers, if you wander aimlessly, you will need to remember to keep the river on your left as you walk north to Shag Bay and on your right when you return to Geilston Bay. 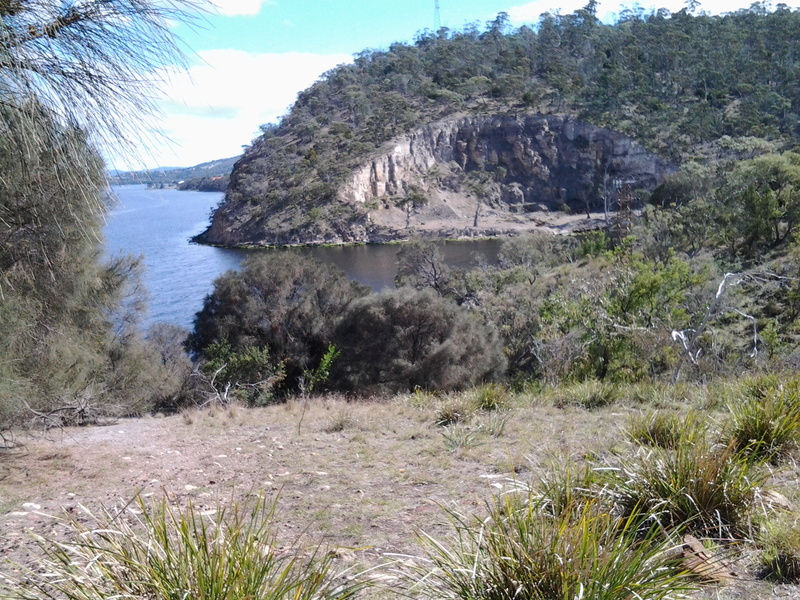 I do not recall seeing any signs at Shag Bay so I missed the aboriginal midden and quarry. 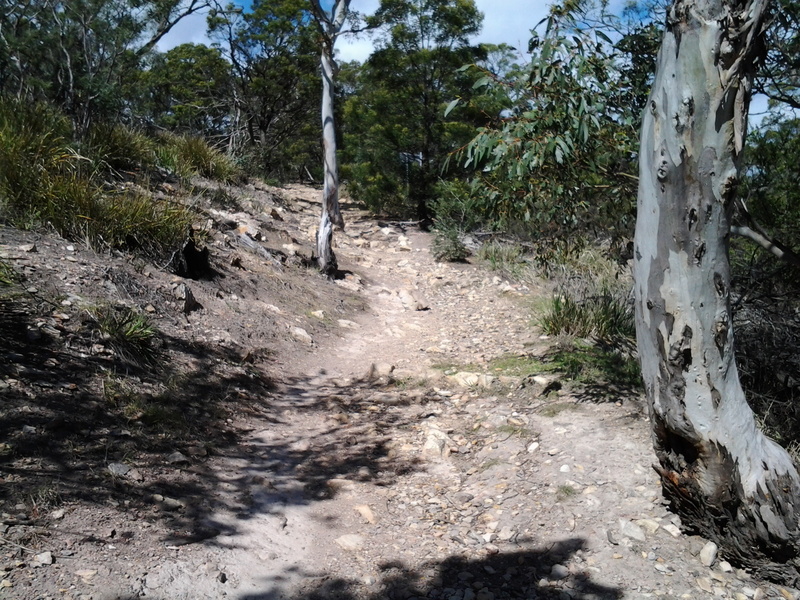 This entry was posted in Derwent River, Hobart, Mount Wellington, Walking and tagged Bedlam Walls, Bedlam Walls Point, Clarence City Council, East Risdon State Reserve, Geilston Creek, HMS Nelson, Shag Bay, Tasmanian Fertiliser Company, White Bellied Sea Eagle on October 19, 2014 by Tasmanian traveller.